This product is ideal for solid black dogs, great for improving the black colour. 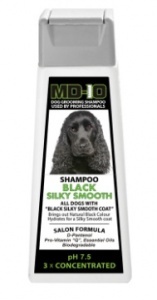 It does not alter other colours, however if your dog has more white in their coat than black please use MD10 White Silky Smooth Shampoo. Suitable for: Cocker Spaniel, Great Dane, Labrador, Doberman.